For her first 'My Life' layout Marni decided to dedicate a layout to all of the things she is, including the roles she plays and the personality traits she thinks she has. She included all of these things (17 to be exact) by using a flower cut from a piece of Heidi Swapp 9x9 patterned paper. She then used a combination of black Heidi and pink Lil Davis rub-ons to create the words she wanted in the petal of the flower. Marni has a new found love of Heidi tape and in this layout she covered her mini Basic Grey monograms in it. 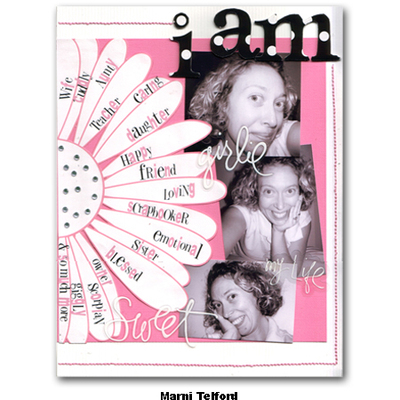 To finish her layout off Marni added some Heidi silhouette words to her photos, Heidi pink jewels to the centre of her flower and of course hand stitched a border to tie it all together. Mel chose the BasicGrey Gypsy papers as she wanted to convey a happy and bright layout to lift the colours in the photos. Using the Gypsy Romany patterned paper added an interesting feature to the layout - Mel handcut the flowers and stem. Her journalling reads: Okay, so I'm not the perfect gardener, weeds poke their little heads up in my garden, sometimes I forget to water plants and I have no idea what will grow where - I just plant things and hope for the best!! But, I do love my garden. I love to see the bulbs come up and bloom in Spring. So much colour and beauty. The garden soothes me, it's relaxing to dig in the dirt and pot new plants. We planted a vegie garden this month, let's hope it grows. 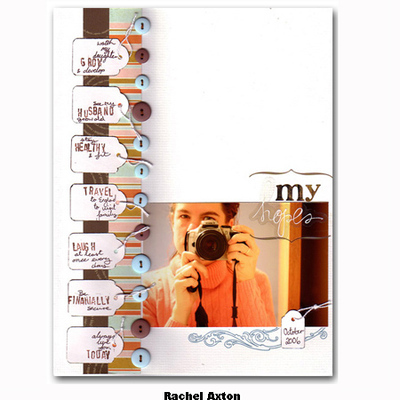 Rach wanted to keep this layout simple and she LOVED the way it turned out. She took the photo of herself in her bathroom in Canberra, no flash and no specific need in mind, she just had a bit of fun taking a few different shots. Because of no flash, the photo came out quite peachy, and for some reason that appealed to her, and she didn't alter it at all. After printing it she flicked through her papers and spotted this Scenic Route paper and instantly knew she had to use it. She loves the colours in it and they work sensationally with the photo. She teamed it with a strip of Carolee's brown paper and a mix of SEI buttons. 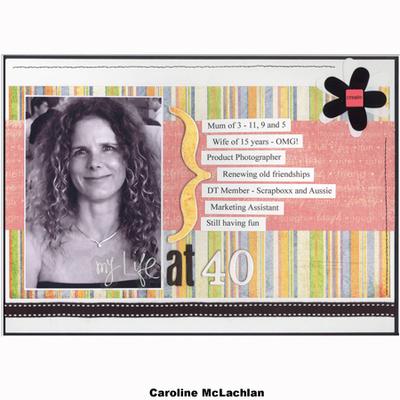 She has used the silhouette word on the photo in this layout, taking advantage of the dark background of the photo and attached it with her little xyron. 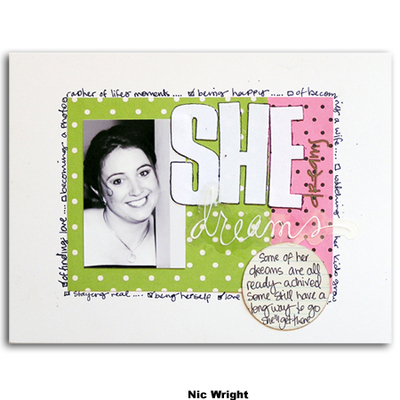 Nic has chosen this layout to be themed in "She" style. She has added her journaling around the patterned paper as a border, making little tick boxes so she can tick them off after each dream is complete. She has used a Heidi Swapp Silhouette as a sub-title for her layout, placing it over bright coloured papers so that it stands out. The papers are a mixture of SEI and Scenic Route. The letters 'She' are SEI Iron-ons, which have then been outlined in black pen to make them stand out. For this section of the EDM - My Life Tamar plans to use a series of candid photos that sums up what she sees in her everyday. This shot taken only last week is a common occurrence in her house - Sofia loves to sneak back out and fall asleep on Dadda. The only thing unusual about it is when she snapped Richard was still awake - usually he is just as asleep as she is! 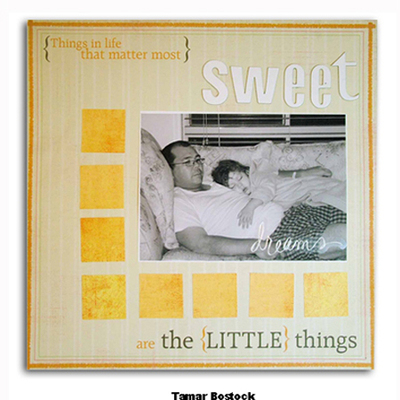 Tamar has used the FK onsert silhouette as a layer on top of the photos and created a double title with the Heidi Letters - Sweet Dreams. The printed Carolees Paper acts as a second title. 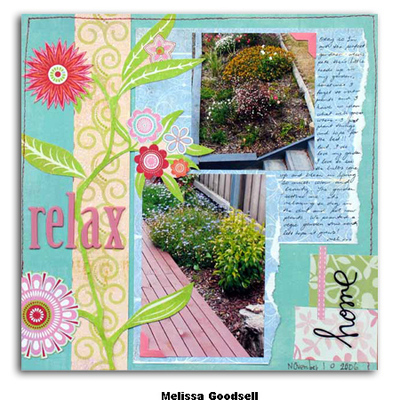 Caz has used pastel coloured paper from BasicGrey and Carolee’s Creations to create this girly looking layout. She will be focusing on things that were happening in her life when she turned 40, 30, 20 and 10 to complete her ‘My Life’ pages for her Everyday Moments Album. The title is created using the onsert and Heidi Swapp chipboard alphabets. Strano ribbon, Queen and Co accents and machine sewing finish it off.